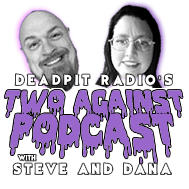 This week its Two against Three, Dana and B Plan talk about our top 3 underappreciated horror movies, plus their thoughts on James Wan's Insidious: Chapter 2!!! 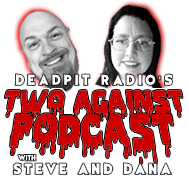 This time Dana and Steve run around Kentucky's premiere Horror/Paranormal show Scarefest. Steve get run down by Christine and watch favorites Friday the 13th part 5 and part 7 plus the recent film You're Next. So listen and clean your nasty shitbox!!! Dana and Steven travel to Horrorhound weekend plus we watch 'The World's End', 'I spit on your grave 2', 'Rewind This' and discuss the 'Nightmare on Elm Street' movies and nasty men on chat-roulette and even more! ! 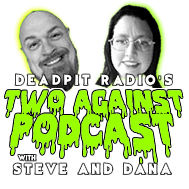 Dana and Steve take the Boardinghouse 2 and a half hour cut challenge, see who makes it thru it alive. We also check out Nightmare In A Damaged Brain and Wild Beasts!! So kick back, pop open a brewski and listen up!! ! 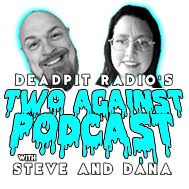 For the first time on Deadpit Radio Network Dana and Steve fill their weekend with a ton of movies, including The Conjuring, Insidious, The Car, and even Via Knievel. Hear the newlyweds take about every type of movie under the sun!! !